You’re likely to see just about any kind of machine at the Midwest Tandem Rally, held this year in Middleton, Wisconsin, next door to Madison. Old, new, steel, aluminum, titanium, and carbon fiber frames. Tandems, triplets, quads, quints. Upright bikes with two wheels, recumbents with two or three. But this, this is big. 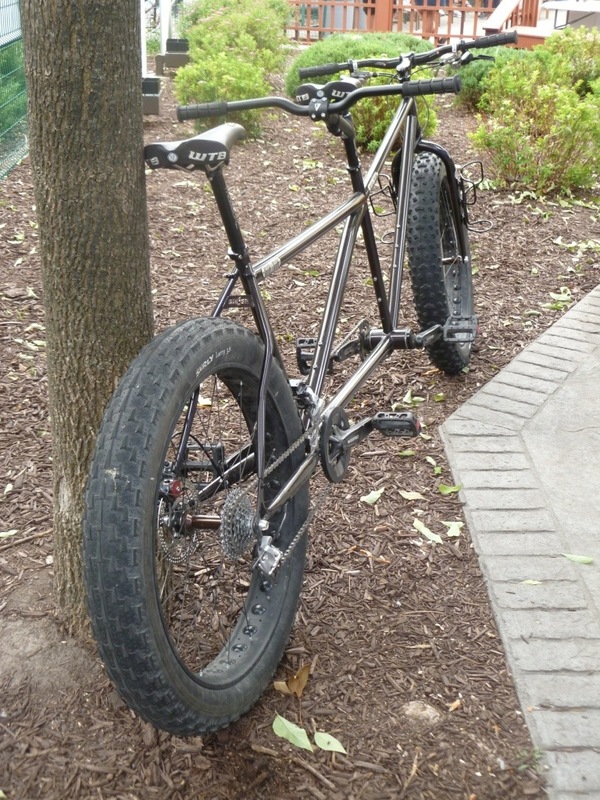 Big tires, big rims, wide hubs and bottom brackets so wide you might as well quit referring to your crank’s Q factor. 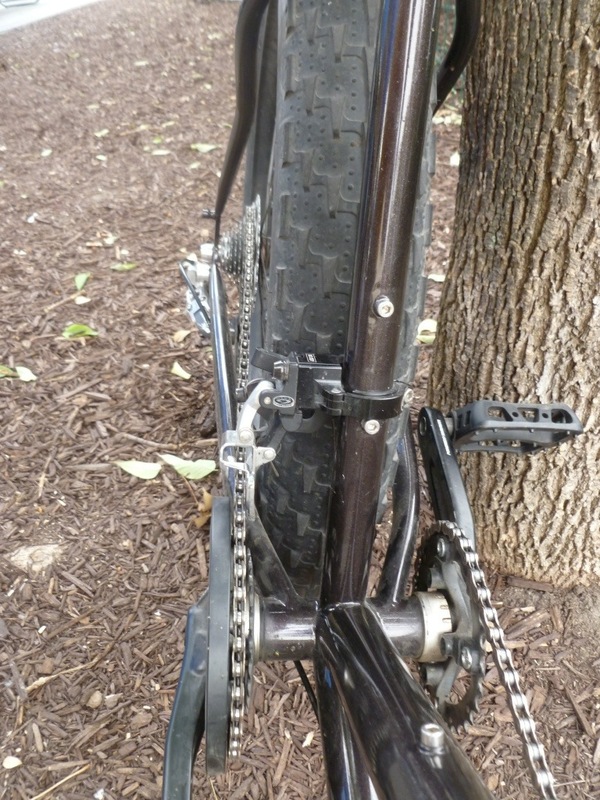 When crank arms are this far apart, it ought to be enough to know your feet still occupy the same township. 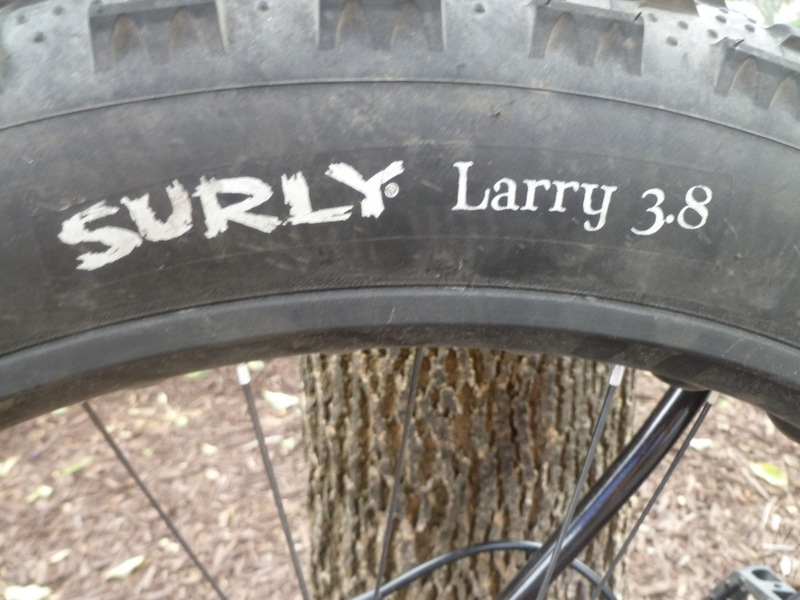 I may have missed it, but 616 Bicycle Fabrication, based in Grand Rapids, Michigan, doesn’t list this tandem on its website, though it does offer US-handmade single bikes built around Surly Bike’s wide rubber. 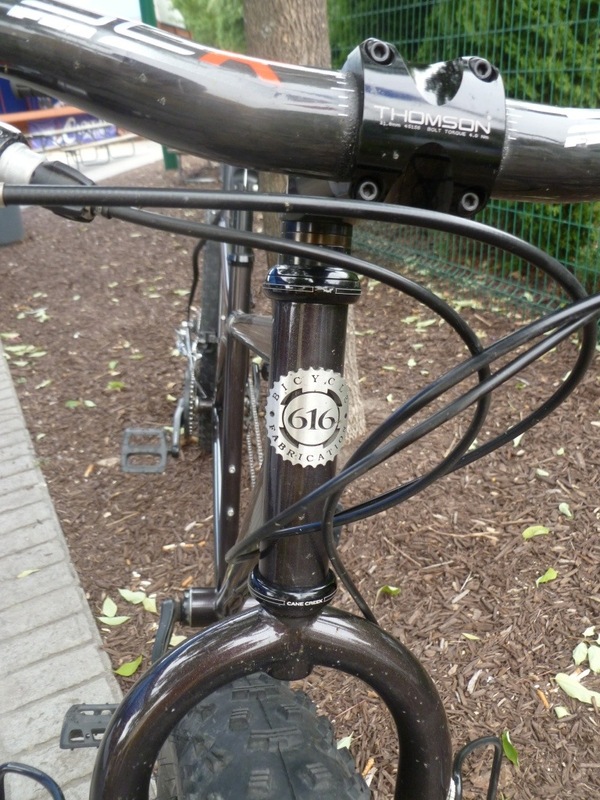 616 (or Six1Six as the cutout reads) ID on the seatstay bridge. Not the usual water bottle cages, and not in the usual place, either. Think big, stay hydrated on your next snow or sand ride. Note: I found this tandem near Capital Brewery’s beer tent in Middleton. Let the record reflect that I viewed the machine before placing my order. And anyway, you can see it too, can’t you? 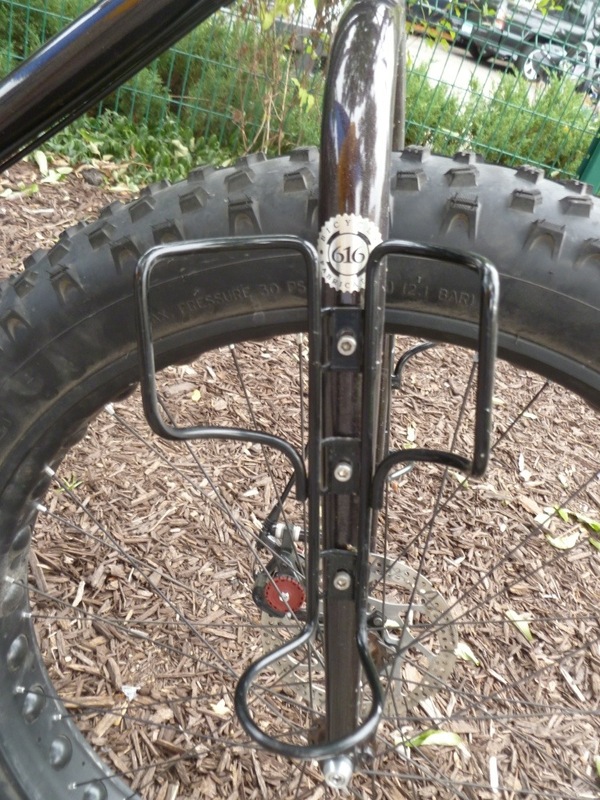 This entry was posted in Other bicycles and tagged Fat tire, Middleton Wisconsin. Bookmark the permalink. 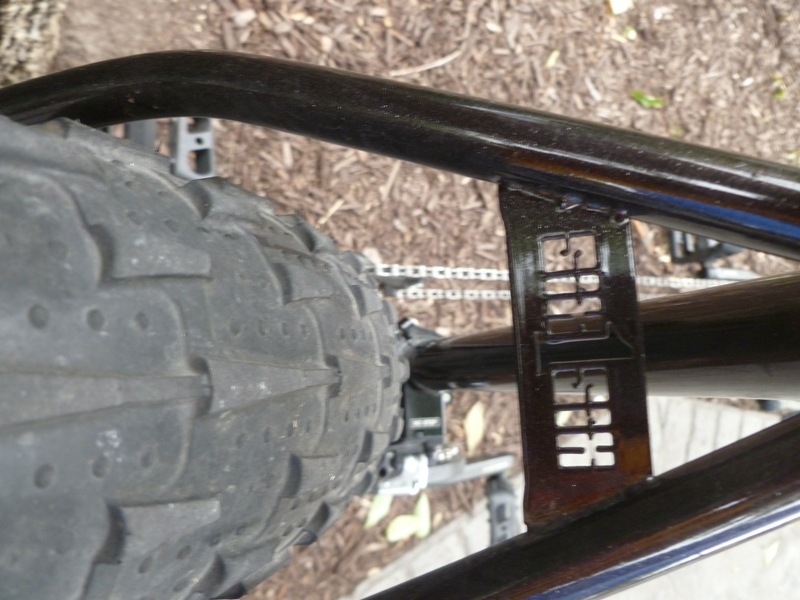 I had not considered the width of the bottom bracket required to make this all work – now I can see how a trike version makes sense from the aspect of Q-factor and coordination with available hip displacement. And yes, Sam – I can see it. I just wonder if you’re “gonna need a bigger tree” – to lean this beast against.